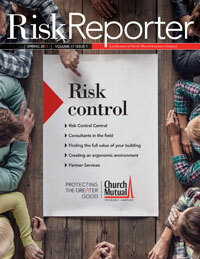 The Church Mutual Risk Reporter newsletter provides tips and insights to help you recognize exposures and implement risk control solutions at your facility. 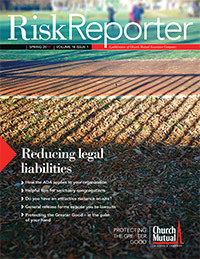 This issue of Risk Reporter provides insight on reducing legal liabilities. We cover a variety of topics from ADA implications and sanctuary congregations to attractive nuisances and more to help you navigate potentially litigious situations. Learn more about the new Church Mutual Now™ app and how it can help you stay in front of risks and liabilities. Do you have an attractive nuisance on-site? 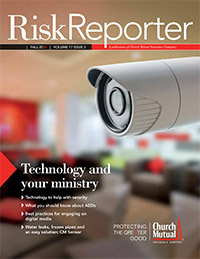 This issue of Risk Reporter will help break down the technicality of some forms of technology, showing you ways it can help make your facility safer and more secure. We want to help you avoid disruptions to your ministry. Regarding the forms in this issue: They are made available as sample releases/waivers. Church mutual insurance company wishes to point out that no warranty attaches to these sample releases/waivers, and in fact, these releases/waivers may not be appropriate for the specific needs of a particular entity. These releases/waivers are not a substitute for good practice, proper supervision, and diligent oversight and control. There is no guarantee that these releases/waivers will protect any facility that chooses to use them. Before using these releases/waivers or any similar documents, you should consult with your own attorney to make certain that the document you eventually use is correct and current under the law of your particular jurisdiction and that the document meets your needs for your particular situation. 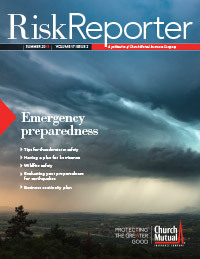 This Risk Reporter takes you Emergency Preparedness when it comes to inclement weather. Learn the steps you can take to keep your organization safe no matter what comes your way. 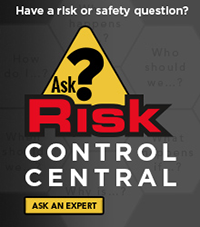 This Risk Reporter shows you how risk control is fundamental to the safety of your organization. This translates to a safer environment for all, fewer disruptions and fewer financial hardships to your organization. 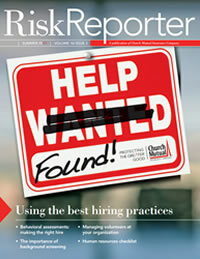 This Risk Reporter will show you ways you can screen potential employees and how to manage volunteers. We've also included an HR checklist to make sure you are following best practices. 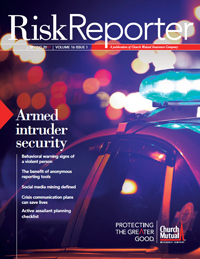 This Risk Reporter will show you ways you can track, monitor and compile a list of suspicious behaviors so that you might avert a violent event from occurring at your facility. We&rsquove also included information on crisis communication plans. 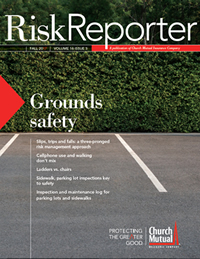 Browse past issues of Risk Reporter for more tips and strategies to help you prevent injuries at your facility, reduce damage to your property, and identify other potentially dangerous risk exposures inside and outside of your organization..